The school district, which covers 133 square miles around northeast Colorado Springs, serves 21,000 students and 15 schools, including 15 special needs schools outside of its geographic district. Each day, 84 school buses transport 3,800 of those students on 54 routes. During the winter months, weather can be unpredictable and pour 92 inches of snow per year. 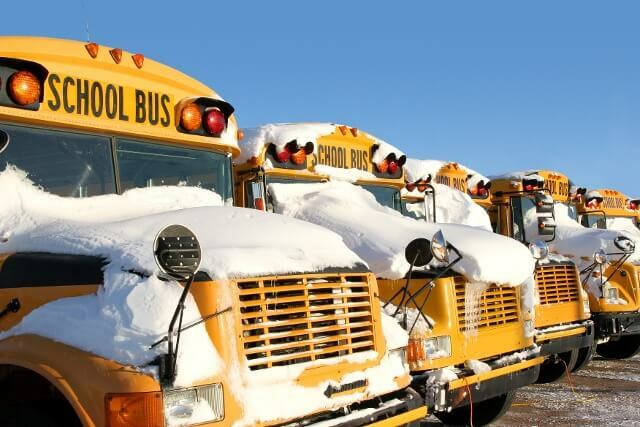 The school district needed a system to efficiently communicate school closings and transportation delays to everyone involved. The district’s switch to the SafeStop app helped in four major ways. 1. The communication kept parents informed. In cold weather in particular, students don’t want to stand at a sub-zero bus stop in the morning, and parents want to make sure their students board the school bus safely. With the SafeStop app, parents can see the location of the school bus, as well as estimated arrival times for each bus stop. 2. The new system saved administrators time. When a school bus was delayed previously, the school district’s transportation team looked up individual students in the student information system to determine location and contact parents. For each school bus, this could mean 50-70 students and hours of work. SafeStop’s real-time parent communication portal, however, informed parents immediately. 3. The tool helped to keep children safe. Sometimes children don’t arrive home on their assigned school bus when expected. They’ll get off on the way home to go to a friend’s house, and parents call the school, wondering where their children are. Now, parents can use the SafeStop app to see exactly where their child gets off the school bus. 4. The app helps transportation directors monitor performance. The SafeStop Analytics platform includes information about Key Performance Indicators, such as on-time performance, route deviation, school bus idling and school bus speeds. Designated SafeStop analysts also provide insight and tips and two report cards per year with route-by-route assessments. District 49 in Colorado appreciated the ease of communication and the analytics to make school bus performance efficient, safe and comfortable for all involved.